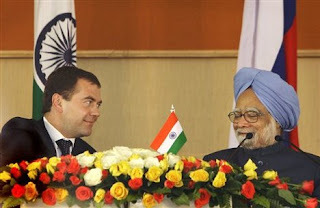 After the collapse of the Soviet Union and the liberalisation of Indian economy the Indo-Russian defence ties has evolved from buyer–seller to a broadbased partnership. India agreed to launch and partnership in few of Russian version of GPS navigation satellites. India and Russia are soong oign to come up with their joint 5th generation fighter aircraft (See: Russia to rule the sky once again). Disappointed with US, India has chosen Russia this time to work with for its second moon mission and both the nations will send its moon rovers. In a recent historical moment India and Russia has signed a nuclear deal which gives India more flexibility over famous Indo-U.S nuclear deal. This will ensure free transfer of crucial technology and uninterrupted nuclear fuel supply for Indian nuclear reactors. Fuel supply is very important for India as India doesnt have appreciable amount of Uranium and the NSG (nuclear Supplier Group) was not properly opening up to supply fuel to India. Under this nuclear deal Russia will not discontinue the cooperation even if India conducts nuclear tests unlike the Indo-U.S nuclear deal. On this Pakistan has given a tough reaction as it fears of power imbalance in South Asia. Pakistan also recently signed a local nuclear deal with China which also gives it some of the similar facilities but doesn’t recognizes it as a nuclear nation. India warned Pakistan for misusing of American and European Union’s economic and military aid against India. Pakistan’s nuclear arsenal has increased sizeablily with a great pace, the world is unclear how the country which is not able to feed, educate and save its own citizens from terrorism is able to develop nuclear weapons so fast? Russia has agreed to help India build four more new nuclear reactors around the country. India and Russia has also extended their long term military partnership till 2020, and protocol for joint development and production of military equipment like multi role transport aircraft for both the armies.